The internet is an invaluable tool when planning a wedding and if you are in the wedding business, having a website which engages the “bride to be” is vital. 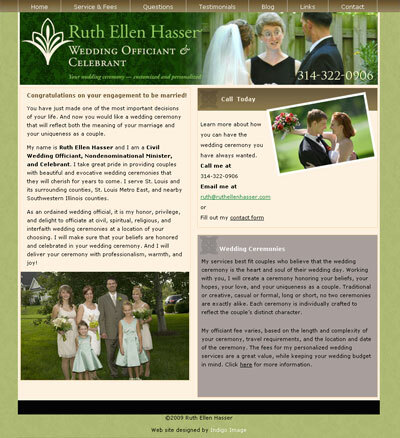 Ruth Hasser, a St Louis wedding officiant and celebrant, understood this and we began working with her in the design of her website in early March. A picture speaks a thousand words and we incorporated a photograph or Ruth in action and built the site around a natural color palette of greens, browns and cream and topped it with an intuitive navigational tool. Internet marketing was also a priority for the site and it has been optimized for the search engines and also includes a custom designed blog.